The first ship I post on the forum, any feedback is welcome. most importantly: a lvl. 2 battery with a battery charger. 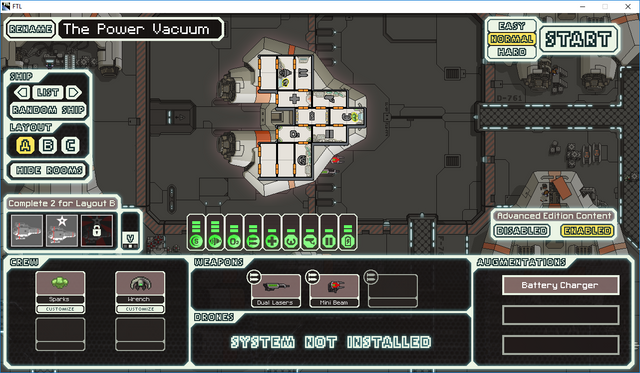 this is going to be very important, as the ship starts out with only one power bar and a zoltan. that about covers it, you also get an engi to keep the zoltan company. Last edited by LizardNips on Sat Oct 28, 2017 7:31 pm, edited 1 time in total. Gratz on your first ship mod! (Playing on AE Hard) For one, it's a very hard ship to play, and I quite like the challenge, you could say it's a harder variant of the Cerenkov. However it does spark an issue: you actually have too little power at the start, (For reference, the Cerenkov had 4 zoltan, 2 reactor power, and a backup batter) perhaps give the ship an extra Zoltan? Would certainly make the ship slightly easier to play. Also, the ship class in the hangar is "Spotter" which IICR is from Biohazard's Spotter ship? Perhaps you could change that yourself. Overall not a terrible ship, but still needs some tweaking to lift it from the UP (pun...?) stage. Isn't the Spotter just a Federation Bomber rotated 90 degrees? Or am I missing something subtle here? stylesrj wrote: Isn't the Spotter just a Federation Bomber rotated 90 degrees? Or am I missing something subtle here? It is. Luckily without the restrictions that one came with.